If you are thinking about cycling the Camino de Santiago with CaminoWays.com, we have prepared this useful list answering all your questions about your new best holiday friend: your bike! You have decided your are cycling the Camino, you have booked your self-guided tour and you are now wondering how it will work. We can also organise guided Camino de Santiago cycling tours for groups, contact our group team at grouptours@caminoways.com. We recommend cycling the Camino only if you have some experience as a cyclist and are familiar with essential bike maintenance such as changing a tube, fixing the chain if it comes off or attaching the pedals. 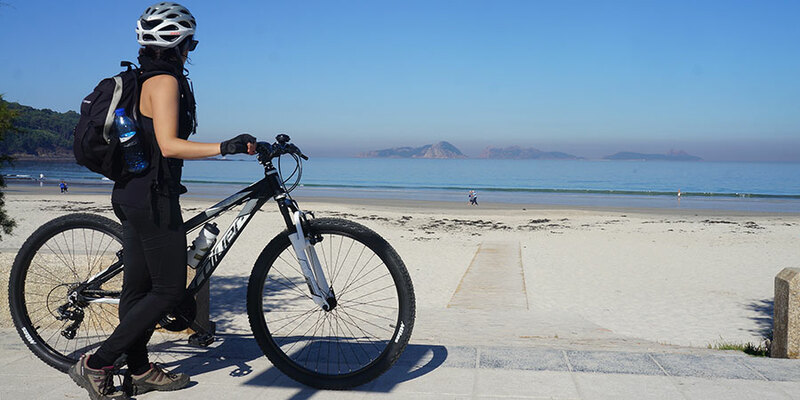 Your bike will be delivered to your first hotel, ready for the following day: your first day cycling. The bike will be neatly packed in a box so the handlebar needs to be straightened and the pedals need to be attached and secured (instructions included). It is important you check the bike before you start your journey, making sure everything is working properly. If you think there is something not quite right, let us know so your bike can get replaced and avoid trouble on your way (in a way, it is similar to renting a car!). Once you finish your cycling trip, your bike will be collected from your last hotel; if you have an ebike you should bring it back to the bike shop in Santiago. You can see full details in the general information document included in your holiday pack. If mid-tour, you decide you don’t need some of the bike accessories (such as the pannier, etc…), make sure to pack them in your suitcase so it can be transferred easily (avoiding additional charges and risk of losing the equipment). Our bike rental packages include a €100 refundable deposit. Do not leave pedals or any other bike accessories supplied behind in your hotel, as you will be charged for loss or damage of equipment. 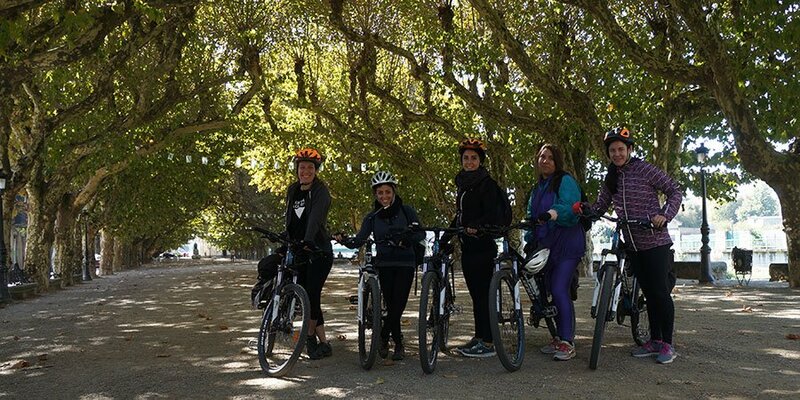 A minimum period of 3 days applies when hiring a bike for your Camino de Santiago trip with CaminoWays.com; a minimum of 10 days if you are hiring an ebike. Your bike: We work with local companies and you will get an aluminium 27-gear mountain bike with break disks and 27.5 inch wheels, as standard. These bikes are specifically designed for the Camino de Santiago terrain and will be adapted to your height (it is essential that you give the reservations team your exact height so you are provided with a suitable bike – particularly if you are cycling the Camino with children). The bike comes with a rack, bottle holder, lock and reflectors. Contact our travel specialists if you would like to upgrade your hired bike. 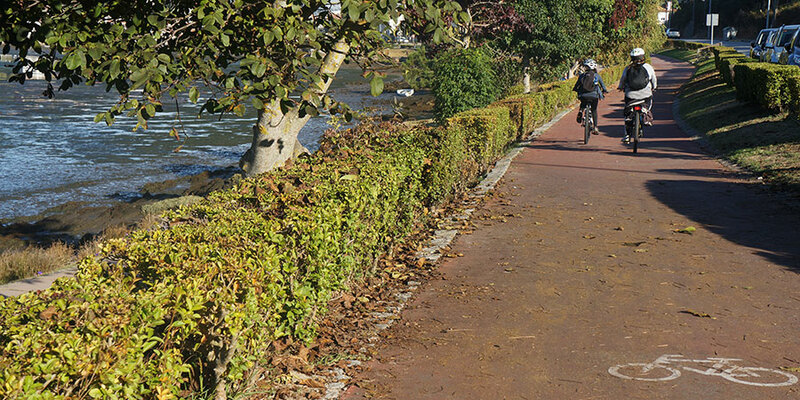 Ebikes are available on selected routes, for Camino trips finishing in Santiago de Compostela. Pannier Pack (see images to give you an idea of size): with a bike repair kit inside. (*If you don’t need it, just let us know in advance). The repair kit includes a pump, set of tools, spare inner tube and cables; as well as a simple label showing you how to carry out essential bike maintenance. It also comes with a bike lock. Please note that the panniers are not water-proof so it advisable to bring a dry bag with you for the trip. Helmet rental is also included as part of your package, but if you don’t need it and you rather bring your own, please let our team know. Bear in mind, by Spanish law, both cyclists must use officially approved protective helmets when riding outside urban areas (children under 16 should wear it at all times), except in long steep slopes, on the grounds of medical reasons or under extremely hot conditions. Failure to comply with this could result in a traffic fine. Additional bike accessories such as gel cover and child seat can also be hired. If you are cycling the Camino with kids, let our travel consultants know in advance as we also have got various options: a bike seat for kids from 9 months up to 22kg (3-4 years of age approximately), bike trailer for toddlers and 24″ bikes for kids from 6-7 years of age (120cm min). We will also give you suggestions for a children-friendly route/itinerary. We generally suggest covering approximately 25kms per day with children. *Ebike: Ttrekking ebike available with 28″ wheel. We have carefully planned the distances you will cover by bike on the Camino, taking into account the nature of the terrain, type of track and other circumstances such as the fact that the trail is shared with walkers in most cases. If you feel distances for your Camino cycle are too short or long, talk to our travel consultants when you are planning your trip. There is probably a good reason behind the mileage chosen, just ask us! The Camino de Santiago routes cover thousands of miles so it is difficult to have someone on the ground at all times but relax, it runs smoothly all the time! CaminoWays.com has a 24/7 support number should you need assistance and advice (this number is provided with your booking/holiday pack); we also provide you with a support number from the bike provider. While we are not able to send someone to repair your bike on the Camino trail, our trusted providers will give you as much support as possible. Your bike comes with a repair kit for essential repairs such as flat tyres and punctures. In the unlikely event that you had a second puncture, we can provide you with the contact details for the closest bike repair shop (you will be responsible for repair costs). If you are in a remote area and don’t feel like walking, we can also get you contact details for local taxi drivers (a taxi transfer will be at your own cost). If you feel you need a break from cycling, we might be able to organise a transfer for your bike but we will need 48hrs notice and there will be a cost associated to the bike transfer (as additional luggage transfer). When cycling the Camino it is important to bear in mind you are sharing the tracks with walkers, so be mindful and respectful to other pilgrims, whether on foot or two wheels.